Hi everyone! Its so very nice to ‘meet’ you all. My name is Manon, but some of you may already know me as Loqi. I am a 24 year old girl from the Netherlands and one of my passions is…well how did you guess?…nailpolish! Deborah graciously offered me a weekly spot on her blog and, as I would really like a crack at it, I accepted. I will be showing you lots of pretty colours (new and old), some nail-art and maybe a comparison or two. Feel free to ask me anything, I would love to get to know you all. For my first post I thought I’d start of with a beauty that has found its way into my (humble) collection only recently: Zoya Gemma. 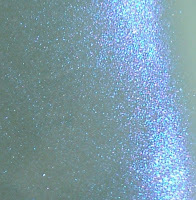 Gemma is a light mossy green colour with a very nice blue sheen to it. This pretty girl has a very nice consistency, applies really well and dries even better. As I am a big fan of full-nail plates for stamping I thought I’d pimp her a bit with another green: Sir! Yes, Sir! from Catrice. And as you can see the two colours compliment each other nicely. I hope you guys like this manicure and I’ll see you next week! Wow .. Gemma looks so dark in your photos. Either way, I love the color. It's such a pretty polish. Your nails look gorgeous! WOW! That stamp makes it look amazing!